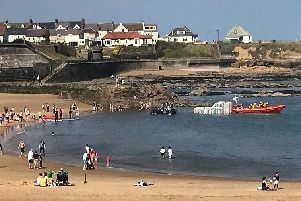 Competitors take part in the Whitley Bay Beach assault. Brave souls put their bodies on the line for personal glory or raise money for charity. Hundreds of competitors, competing as groups or individuals, overcame a variety of obstacles and tasks while taking part in the Warrior Beach Assault on Whitley Bay beach. It’s a tough race and none of us found it easy but, we have enjoyed it. The yearly event is along the lines of Tough Mudder, where participants have a gruelling 10k to cover whilst still traversing such things as the Hay Bay Hurdle. Despite the wet and windy weather, there was a large turnout. Among those who took part were the Fifth Fusiliers, who ran alongside each other through the whole course. Other members of the Fifth Fusiliers ran a hot drinks stand at the finish line for competitors and spectators.